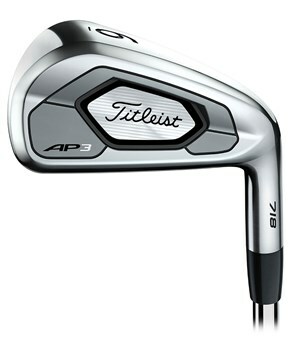 The Titleist AP3 718 is a new introduction to the traditional iron line up that Titleist have stuck to over the past few years. The best way to describe the AP3 718 is as a crossover iron. It is a fantastic blend of the fast and forgiving performance of the AP1 718 and the playability and performance of the AP2 718. Specialised for speed, the AP3 718 features a hollow-blade construction with their L-Face inserts that will launch the ball on a higher, more forgiving ball flight that will deliver shot-stopping spin even in the longer clubs. Off-centre performance on the AP3 iron will provide you with the opportunity of missing the sweetspot and still having half a chance of making par. Whilst shots hit from the middle of the clubface will provide a truly Titleist feel that will provide an incredibly consistent ball flight. Looking down on the AP3 and you notice a longer blade length in the longer irons that will inspire confidence, as you work your way through the set the profile changes and you get a club head that sits nicely and provides a consistent ball flight aimed at providing distance and accuracy control. Titleist have fitted the Dynamic Gold AMT Black shaft to this players distance iron, it sits between the White and Red version that are offered in the AP2 and AP1 respectively. 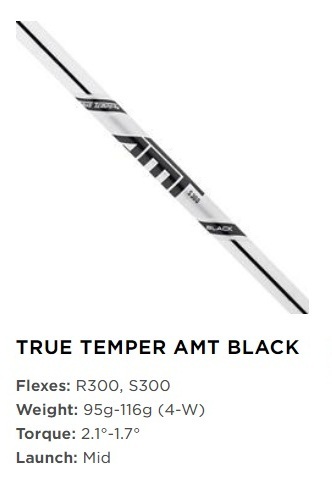 The AMT Black will still provide the same progressive weighting with a mid-launch flight characteristic that will aid that controlled ball flight. 3 Iron 19° 60° 39"
4 Iron 22° 61° 38.5"
5 Iron 25° 62° 38"
6 Iron 28° 62.5° 37.50"
7 Iron 31° 63° 37"
8 Iron 35° 63.5° 36.50"
9 Iron 39° 64° 36"